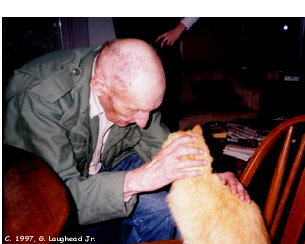 Beat writer William Burroughs at home with cat Ginger. Daniel Diaz in background. "He was a gray, non-descript-looking fellow you wouldn't notice on the street, unless you looked closer and saw his mad, bony skull with its strange youthfulness--a Kansas minister with exotic, phenomenal fires and mysteries." Jack Kerouac on William Burroughs, in On the Road, 1955.